Please note: This product is not suitable to use during chemotherapy treatment, but may be used after a course of treatment is completed to help the body re-stabilize. How has ChemoCleanse helped others? How do I use ChemoCleanse? Chemotherapy is the treatment of cancer with specific drugs that can target and kill cancer cells. Because cancer cells grow and divide abnormally quickly, chemotherapy drugs are made to recognize fast-growing cells and destroy them. Unfortunately, healthy and normal cells which happen to have a high growth-rate are also harmed during chemotherapy. The damage to rapidly-dividing, healthy cells from chemotherapy is what can cause the notorious side-effects. The fast-growing but healthy cells that are most likely to be destroyed by chemotherapy are cells in the bone marrow, digestive tract, reproductive system and hair follicles. Vital organs including the heart, kidney, bladder, lungs, and nervous system may also be affected depending on the specific drug(s) used. Every individual will respond differently to chemotherapy but many chemotherapy patients do go through similar experiences and develop some of the common side-effects. Some of the most widely-reported side-effects of chemotherapy include fatigue, nausea and vomiting, aches and pains, hair loss, anemia, infection (due to reduced immune functioning), sores in the mouth and throat, diarrhea and constipation. Due to the toxic nature of chemotherapy drugs, the organs responsible for processing and eliminating toxins like the kidneys and liver, will be under hugely increased pressure during and after the treatment and may become more susceptible to damage. The negative effects of chemotherapy on the liver and kidneys is further exacerbated by the multiple drug prescription that often accompanies cancer treatment. Natural remedies can provide great benefit in a gentle, yet effective manner. Herbs are Nature’s medicine – and come without side effects. In this way, the body is supported and toxin removal is promoted without any further synthetic chemicals being introduced into the system. During chemotherapy the body is put under strain and natural remedies can help the body to re-adjust after chemotherapy is fully concluded. Sleep is recommended and as much rest as possible during this time. ChemoCleanse is a 100% safe and effective natural remedy for cleansing the body of toxins from chemotherapy and other prescription drugs. ChemoCleanse also contains natural ingredients that help to revitalize and strengthen the system to assist with recovery and to improve liver functioning. Astragalus membranaceous is also known as Huang Qi in Traditional Chinese Medicine. Recent research has highlighted the ability of this herb to improve the functioning of the immune system and protect against disease. Studies also suggest that Astragalus helps prevent the spread of malignant cancer cells to surrounding healthy tissue. Research conducted by the University of Texas found that an extract of Astragalus helped to restore immune functioning in cancer patients with compromised immune systems. This is particularly important after chemotherapy and radiation treatment. Astragalus also helps to lower blood sugar levels, accelerate wound healing, relieve fatigue and lower blood pressure. Silybum marianus (Milk Thistle): This herb has been used since ancient times for treating a wide variety of ailments, but particularly as a liver tonic. Milk Thistle is widely prescribed for preventing and treating liver disorders as well as protecting the liver from damage caused by alcohol, viruses and prescription drugs. Milk Thistle is a potent antioxidant and laboratory studies indicate it may have useful anti-cancer properties. Taraxacum officinale (Dandelion) contains bitter principles which have a beneficial effect on the liver and digestive system. Dandelion is a rich source of vitamins and minerals, including Vitamin A, D, C, various B Vitamins, iron, lecithin, silicon, potassium, magnesium, zinc and manganese. It enhances liver and gall bladder functioning and promotes efficient clearance of harmful toxins from the body. Dandelion is also considered a very effective general tonic and is known to improve bile flow and reduce inflammation. ChemoCleanse contains less than 1% pure pharmaceutical grade ethanol when diluted as directed and has no artificial flavours, colours or preservatives. 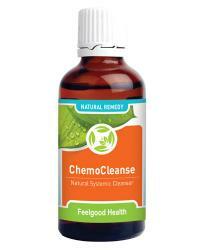 ChemoCleanse comes in a convenient tincture (drop) form to be diluted in water or juice. It is available in 50 ml bottles. Adults and Teenagers: 15 - 20 drops in approximately 1/4 cup water or juice three times daily. Children: One drop per age year of the child diluted in approximately 1/4 cup water or juice three times daily. Caution: Safety during pregnancy and nursing has not yet been established. Dandelion (Taraxacum officinale) should not be used in conjunction with any other diuretic medication such as Lasix or hydrochlorothiazide. Note: This product is not suitable to use during chemotherapy treatment, but may be used after a course of treatment is completed to help the body re-stabilize. Within a few hours there will be increased urination as the kidneys begin to flush toxins out of the body. Thereafter, you will feel a little more energetic every day. Day by day, symptoms like fatigue, lethargy, aches and pains will decrease and energy levels and a feeling of well-being will increase. Tip: For chemotherapy-related hair loss use ChemoCleanse in combination with ReGrow Plus and ReGrow Scalp Massage Oil. One 50 ml bottle will last approximately 30 days. A 120-day supply would be four bottles. See the Buy 3 Get 1 FREE special offer. My doctor said I shouldn’t use other medicines during my chemo - is ChemoCleanse safe to use? As many drugs may interfere with the effects of chemotherapy, it is important to discuss all medications, supplements and natural remedies you are taking with your doctor before beginning chemo. ChemoCleanse has been especially formulated to support your health and minimize adverse effects AFTER an entire course of chemo is complete. Of course, as your doctor is ultimately responsible for monitoring your progress and well-being it is advisable to discuss ChemoCleanse with him/her before using the product. What else can I do to improve my health after having chemotherapy? There are a number of things you can do to improve your overall health after cancer treatment as well as to optimize your chances of becoming or staying cancer-free. Ensure that you take it easy and get enough rest during your treatment - save your energy and build up your strength. Try to avoid crowds and people who are ill with colds and flu for a little while as your immune system is not functioning optimally after chemotherapy. Being diagnosed with cancer and undergoing the grueling treatment can be very traumatic - talk to a counselor or someone you trust about what you are going through and the feelings you are experiencing, whether of anger, fear or sadness. Eat a healthy and balanced diet high in fresh, organic foods. Avoid all synthetic ingredients like preservatives, colorants and flavorants found in processed food. These are all toxins which will put a further strain on your liver and kidneys. Regular, moderate exercise, when you are able, can keep you feeling healthy and strong and will help to reduce the tiredness and side-effects caused by cancer treatment. Be sure to consult your health care provider before starting any new exercise routine. Avoid and protect yourself from the sun. Not only do the sun’s UV rays cause skin cancer but chemo and radiation therapy can also increase the skin’s sensitivity to the sun’s harmful effects. Stop smoking. Tobacco raises the chances of developing cancer, the likelihood of some types of cancer returning after successful treatment and slows down healing. Finally, remember to see your doctor for all check-ups and follow-up appointments to monitor your recovery and general health.